Sinus conditions affect one's eye pressure. This is particularly important for glaucoma patients. 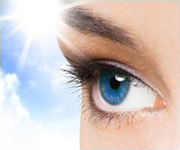 Nasal blockage can have a strong effect on eye pressure and there are subtle effects as well. In addition, I speculate that the nose may offer an effective way for glaucoma patients to improve the long-term health of their optic nerve. The nose can be the doorway to the optic nerve as well as being intimately connected with eye pressure. In this blog post I'll touch on both areas. I have been experimenting with the effect of breathing exercises on my eye pressure since the first days of my personal eye pressure experiment (which began about 200 days and 16,000 eye pressure measurements ago). One of the first things I tried was pranayama. Pranayama is a yogic breathing exercise that often involves closing one nostril at a time. I wanted to see if pranayama lowered my eye pressure. (It didn't for me, but it has for others. However, that's not the focus of this particular article.) This article looks at the effect of blocking one nostril and of sinus issues such as congestion or a deviated septum. I found one research study that showed a strong connection between the pattern of nasal breathing and eye pressure. This effect occurs through the autonomic nervous system. In this study forced right-nostril breathing lowered eye pressure about 25%. "The effect of our intervention was short termed and was meant to spark interest in the effect of the autonomic nervous system on intraocular pressure. Furthermore, the TYPE of glaucoma is crucial (open vs. closed angle) [the intervention was effective in only one type]. The only practical consideration was in explaining how and why making "blebs" [surgical procedure] sometimes was ineffective and why having a consult in otolaryngology may be essential as very severe nasal septal deviation may be causing the increased intraocular pressure via an autonomic effect. Indeed, the lead ophthalmologist in our study routinely has his glaucoma patients checked for nasal septal deviation. Sometimes surgical correction solves the glaucoma problem." Glaucoma patients who do not achieve satisfactory eye pressure reduction results from surgery (or eye drops) and any glaucoma patient with allergies that affect their sinuses should particularly investigate this information further. "I have constant nasal congestion that my ENT thinks is allergic related. I have allergies to dust mites, outside mold, which are pretty hard to escape. "Because of my glaucoma, I told him I did not want to use a steroid spray. He prescribed a saline nasal irrigation system: I use this twice a day at bedtime and in the morning. Already I see a great improvement: I am hardly clogged, and sleep better. It may be helping also to eliminate my snoring. "My only question is will squirting this water into my nostrils do anything to my eye pressure? I will ask my glaucoma specialist about it when I see her next, but that's not for a couple months." I think this person was wise to choose the saline nasal irrigation system. I believe this system is very close to a practice highly recommended in Ayurveda called Jali Neta. In Ayurveda, this "water nasal cleaning" is recommended as a daily hygiene practice for almost everyone. Ayurveda says nasal cleansing exerts a profound physiological effect on the body and mind. On the physical level, this irrigation practice removes accumulated mucus from the nostrils, associated passages, and sinuses. This allows one's breath to flow unobstructed through the subtle channels described in Ayurveda (which are not unlike the subtle acupuncture channels described by Chinese medicine). The regular practice of nasal cleansing maintains healthy secretory drainage mechanisms of the entire ear, nose, and throat areas. The physical effects are the reduction of colds, hay fever, tonsillitis, allergies and sinus infections. The subtle effects are the increased ability to preform breathing exercises and helping to maintain balance between the right and left nostrils. Everyone's breathing pattern naturally changes between the right and left nostrils every couple hours, provided they don't have sinus problems. Keeping the nasal passages clean and clear helps to maintain this important natural balance and flow. Ayurveda says it helps to induce a state of harmony and balance throughout the entire central nervous system, and the systems governing respiratory, circulatory, digestive, and excretory functions. Modern science is now supporting many of these claims and I'm sure more will be verified in time. Glaucoma patients should be aware of any nasal congestion or other sinus issues as well as any allergies. Both of these issues should ideally be addressed at their root level which is the basic health of one's immune system, one's oxidative stress and the general health of one's entire physiology. I personally saw a tremendous improvement when I applied some Ayurveda concepts, particularly adding certain healing food, spices and oils to my diet. Researchers have found that a diet that includes regular intake of spices with anti-allergy capabilities can reduce vulnerability to plant-induced allergies. These spices contain allergy-fighting chemicals that include flavonoids and phenols -- for example, turmeric is rich in curcumin, a compound that is known to have anti-inflammatory properties. There are many other spices that are known to be allergy fighters, and you need to select them for your body type. Sauteing a combination of spices in ghee and using the mixture to season vegetables is a way of incorporating some of these allergy fighting spices into your diet. From the Ayurvedic perspective, it is important to follow a diet for your body type and include Kapha-Pitta pacifying elements for reduction of allergies. lukewarm water and about a teaspoon of organic sea salt is added and mixed thoroughly. The saline solution comforts and sooths inflamed areas. In regard to oil-based nasal cleaning, Ayurveda says that putting 3 to 5 drops of warm ghee or a sesame oil herbal mixture into each nostril in the morning helps to lubricate the nose, clean the sinuses, and improve voice, vision, and mental clarity. Ayurveda says, "Our nose is the door to the brain, so nose drops nourish prana and bring intelligence." That's why I speculate that the nose is the doorway to the optic nerve as well. I assume most glaucoma patients recognize that glaucoma is closely connected with both the optic nerve (which itself is directly part of the brain) as well as the visual centers of the brain. This article touched on some interesting ways in which the health of our nose and sinuses is related to glaucoma. Please let me know if you find it helpful or if you have additional questions or comments. Any registered user can leave comments here. Registration is free (and you will not receive any spam after registering). You can also use the "tag" feature of my blog to search for all posts on "breathing".